A former Minister of State for Education, Prof. Jerry Agada, on Thursday accused the Minister of Transportation, Rotimi Amaechi, of promoting hate speech capable of further aggravating insecurity in the country. 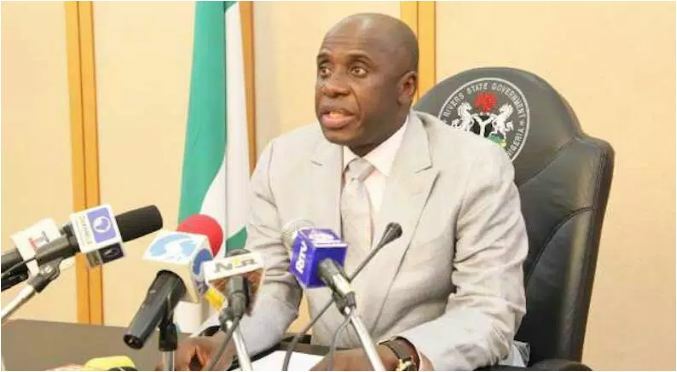 He said Amaechi, being a minister and the Director-General of the Buhari Presidential Campaign should be cautious of his utterances in the public to avoid unnecessary tension. Agada said this in an interview with our correspondent in Makurdi, Benue State. He said it was wrong for the former governor of Rivers State to allege that the killings of 17 worshippers including two Catholic priests in Benue were done by Benue people and not Fulani herdsmen. He described the statement as a hate speech and insult to the sensibility of Benue people who he said had not known peace since January. Agada said he watched a television programme and heard Amaechi accusing Benue people who he claimed were working for Governor Samuel Ortom, as being behind the killing in the state. “I am not happy with this type of statement. This can be regarded as hate speech coming from a supposed high ranking minister of the Federal Republic of Nigeria. “Amaechi should withdraw the statement and tender unreserved apology to Benue people,” Agada said. The former National President of Association of Nigeria Authors said it was unfortunate that Amaechi could start to promote hate speech on the day the Independent National Electoral Commission lifted ban on campaign ahead of the 2019 general elections.